Joining one of our group tours means you’ll have less to spend on travel. With airport transfers and transport during the tour included in the price, it’s one less thing to worry about. Travel this way is safe, fun and avoids the big price tags of private taxis and transfers. At The Bali Adventure you experience luxury travel on a backpackers budget. Thanks to our expert knowledge, we’re able to secure great prices at beautiful hotels. This means you can enjoy stunning accommodation, with picture-esque pools, jaw dropping views, and comfortable beds, without breaking the bank. There is so much to see and do in Bali. Do you want to take a boat ride to see the dolphins? Visit the rice terraces? Explore the monkey temple? Perhaps there is so much you want to do, you’ve know idea how to budget for it all. No worries! On a group tour all activities are included in the price, and carefully planned so that you don’t miss a thing. It’s your tour, so you can be as active or as relaxed you like, but with the knowledge that all activities are available should you want to take to park. Travelling alone leaves you open and vulnerable, meaning you could be at risk of scams. This can include anything from extortionate taxis to overpriced souvenirs and gifts. With a group tour you have permanent access to local knowledge and your English-speaking guide will ensure you don’t end up losing money in scams or fake services. Leaving you free to spend your money on the things that really matter. So, now you know that huge savings are possible, what are you waiting for? Contact The Bali Adventure today to find out more about our amazing, affordable group tours. …I had enjoyed my life so far and was grateful to live in a world of opportunities. But I still felt an overwhelming desire to do more, to see more, to take in the world while I was still in my twenties. Eventually, I found myself repeating the phrase; I want to do something amazing. I want to do something amazing. Before long I had made my mind up. I would do something amazing. I would go to Bali. The world is vast and full of beauty and wonder. I hope one day to see it all. But in this particular stage of my life, I chose Bali. And here are five reasons why. 1 – The culture Bali is known for its rich culture, and there is fascinating history and beauty around every corner. From traditional ceremonies and celebrations, to art, temples and dancing, there is a chance to be amazed by something different every single day. It is the perfect place to be enlightened, inspired and enriched. 2 – The opportunities In Bali you can tick off so many bucket list items on one trip. Amazing adventures such as hiking up mountains, surfing in sparkling seas and cycling around islands are all on offer here. For a more relaxed vibe there are gorgeous infinity pools with breath-taking views and the chance to experience an authentic Balinese massage. And for animal lovers, once in a life opportunities including snorkelling with turtles, visiting the monkey temple and sunrise boat rides to see beautiful dolphins up close. 3 – The weather Good weather breeds good vibes, and Bali weather offers plenty of reasons to smile. Sunny days and warm temperatures make for days lounging by the pool or visiting waterfalls. To top it off Bali boasts some of the world’s most beautiful beaches, perfect for long days in the sun. 4 – The food The people of Bali are proud of their cuisine, making this country an ideal location for those who want to do something truly amazing and try new things. With fresh ingredients and tantalising flavours, food in Bali is said to be a taste sensation. 5 – The price Despite all it has to offer, Bali is an extremely affordable place to visit. With warm, welcoming hostels and luxury hotels there is something to suit all budgets. For many people, money holds them back from travelling, but there are plenty of affordable options to ensure you can do something amazing without breaking the bank. With all that in mind it’s not hard to see why I chose Bali as my “do something amazing” choice. 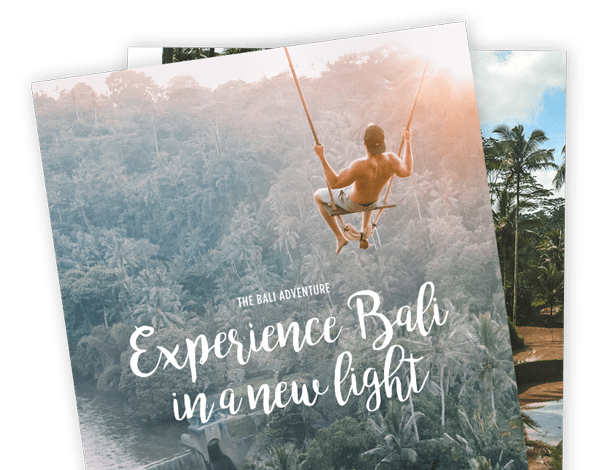 If you want to do something amazing too, then check out The Bali Adventure, where you’ll find the trip of a lifetime at one great price. The beaches surrounding the beautiful island of Bali are nothing short of spectacular. They’re also very diverse, with each beach offering something completely different to its visitors, be it long stretches of white sand, strong waves perfect for surfing or an abundance coral reefs and marine life. When you visit, you should definitely check out the Bali beaches. If you’re struggling to know where to go (there are a lot of options, after all), we’ve put together a little guide of our top 5 Bali beaches to help you find your perfect spot to rest, play or explore. Kuta beach is known as the most famous of the Bali beaches and is a hot spot for both tourists and locals. The Bali Adventure spends a few days in Kuta so you can take a look with us or come back later. During the day, surfers may want to take advantage of the strong current and high waves, and at night the beach is lit up with parties across the many beach clubs. The beach is an 8km stretch of sand so there’ll be plenty of room for your beach towel when you want to take a little time out and soak up the sun. It’s vibrant and lively atmosphere will guarantee a good time and the gorgeous sunsets will have you snapping away on your cameras. A must-see Bali beach. Known also as Pantai Kecil (little beach – cute, right? ), Bias Tugal is a hidden haven in the East of Bali and one of the more ‘secret’ Bali beaches. You’ll have to venture down a 500m rocky path to reach it, but the pay-off of this Bali beach is definitely worth it. White sand, blue seas and an abundance of coral make this place seem like paradise. It’s much less busy that Kuta beach, which makes it the perfect place to idle the day away snoozing on the sand or snorkeling in the sea. The calm sea and low waves make this one of the more swimmer-friendly Bali beaches, and the lack of tourists may appeal to those who prefer a more authentic experiences of Bali. Lovina beach is covered in incredible black sand, caused by cooled lava from the nearby Mt Agung volcano, which makes it pretty unique and an interesting place to visit. There’s also a nearby village and thermal hot springs (again a result of the volcano), and did we mention the dolphins? A lot of people come down in the mornings to catch a sight of the majestic creatures frolicking in the waters. Sanur beach is located near to Denpasar, one of the spots we’ll be visiting on The Bali Adventure, and is known for its traditional charm and relaxed atmosphere. The beach isn’t as lively as Kuta but isn’t as hidden away as Bias Tugal, making it that perfect in-between. Calm waters and less people make this a great one for a family day out, especially if you have young children to keep an eye on! The beach itself is very picturesque; a long stretch of white sand, blue waters and the greenery of foliage of the resort fronts lining the edge. A tranquil highlight of the Bali beaches. Karma beach is the luxury brand equivalent of the Bali beaches. You do have to pay to visit this one, but a day pass is relatively cheap for what you get and not difficult to sort out (you can usually just get them from the beach resort on the day). The beach is said to be a bit of a favourite amongst celebrities and the area has been home to some notable names in the past, so you’ll certainly feel a little bit of a VIP coming here! A cable car down allows for some great views, and free snorkeling gear and paddle boards are included in your day pass. There’s plenty of great food and drink to choose from, and even sunset films for those who enjoy their entertainment alfresco! If you’re going to pay for a beach visit, make sure it’s for the most luxurious of the Bali beaches. So, there you have it! Our round up of 5 of the best Bail beaches, all offering something a little different. From the lively atmosphere of Kuta to the black sand of Lovina, and even an alfresco cinema at Karma beach, Bali beaches really do have it all. Pick yours and get going!